New summer Skills Clinics have been scheduled - Sign up soon as they will fill up quickly! This clinic will cover basic tumbling skills and drills for tumbling such as forward rolls, cartwheels, handstands, round-offs and more. If you love to play on the trampoline and flipping around is your thing this is the class for you! You will learn the safe way to perform trampoline skills and impress your friends. This class will refresh your back-handspring and take you beyond. 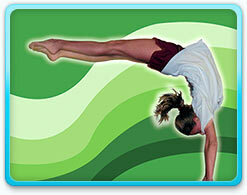 You will work on round-off back-handsprings, front tucks, back tucks, aerials and more! The sky is the limit to what you can work on at this exciting clinic. This class is for those who already have a solid back-handspring. For more information on any of the clinics or to sign up for one, see Margaret at the front desk, or pop her an email.